2. Communion is a reminder of Christ's sacrifice on Calvary for us. 3. The bread and the grape juice in the communion service represent the broken body and the blood of Jesus shed on Calvary. 4. When we drink the wine during communion we receive forgiveness of sins, since the wine is a symbol of the blood Christ shed for the remission of sins. As stated in the verse above. 5. Taking communion is a time to examine ourselves, to ensure we are worthy to take part in the service. 6. Taking communion is a time to forgive and seek reconciliation. 7. Included in the communion service was foot washing, an act Jesus used to teach humility. 8. The foot washing part of the communion service is a symbol of being washed and cleansed from sin. 9. Jesus said the foot washing service was an example for us to do as he did. Jesus said happy are we if we do it. 10. 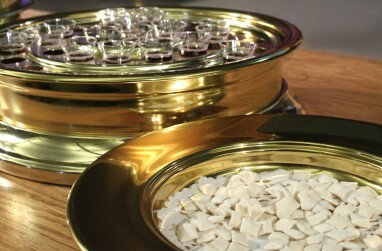 The communion service prepares us for heaven and the marriage supper of the Lamb.